Are you taking over the operation of a clandestine Rebel base? Alright! That's really speaking our language. Because we're all about the Rebellion. And, of course, our top choice for Rebel of the year is the perpetually awesome Princess Leia. So, if you're going to the Echo Base on Hoth, you've got some mighty big shoes to fill! it. We're suspecting you most certainly are! But, a big part of taking over for Leia is going to be re-creating her look. Sure, you won't be the actual Princess Leia, but this is our most desperate hour, and we're accepting reasonable facsimiles! So, just grab this Women's Hoth Leia Costume, and you'll be ready for your trip to the Ice World. It's styled just like her garb from Star Wars Return of the Jedi, and will have you ready to lead the Rebels to victory. Yes, of course, we do know how Return of the Jedi ends, but we have enough confidence in you that we think you can change the outcome! 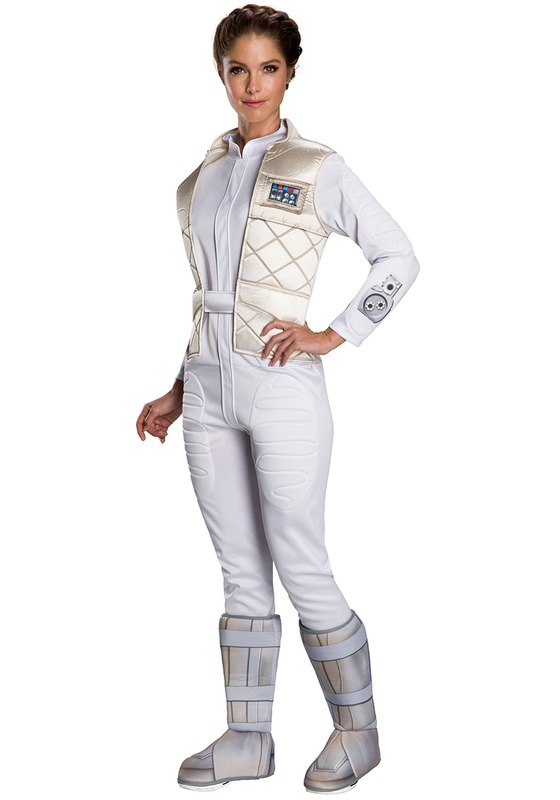 Styled as a costume jumpsuit, this simple costume is a fun callback to one of the most revered Star Wars chapters. The white jumpsuit comes with printed details, and it has an attached vest that also features printed details. Bootcovers are attached, too, to replicate Princess Leia's Hoth unfirom in a simple and slick costume ensemble! Since we've got the world's largest selection of costumes, you've probably already figured out that we're the top spot to outfit your whole gang with Star Wars costumes. You can't save the galaxy by yourself, after all, so shop to get your family and friends into Star Wars styles, and you'll have the coolest group theme ever!